Slide It In: The Ultimate Special Edition is a six-CD/one-DVD set featuring remastered versions of the original U.K. and U.S. mixes of the album, unreleased live and studio recordings, music videos, concert footage and more. Slide It In‘s original 1984 U.K. version was recorded by a partially different Whitesnake lineup than its 1985 U.S. counterpart. The initial recording features singer David Coverdale, guitarists Mel Galley and Micky Moody, bassist Colin Hodgkinson, keyboardist Jon Lord and drummer Cozy Powell. However, at the end of the group’s 1983 tour, Moody quit and Hodgkinson was fired, and their replacements, John Sykes and Neil Murray, re-recorded their parts before Slide It In‘s U.S. release. 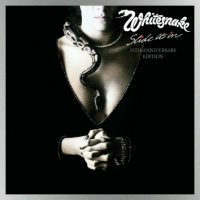 Besides the remastered U.S. and U.K. versions of Slide It In, the deluxe reissue’s CDs feature the B-side “Need Your Love So Bad”; brand-new mixes of the album’s 10 tracks; a full, unreleased March 1984 concert performance from Glasgow, Scotland and four performances from Lord’s last Whitesnake show, in Sweden in April ’84. There are also monitor mixes and Coverdale’s spoken-word intros dating from September 1983; finished and unfinished demos; rough mixes and a new interview with Coverdale. The DVD contains several music videos, including a new promo clip for “Standing in the Shadow”; footage from Lord’s final Whitesnake concert; a performance from U.K.’s Top of the Pops TV show; an interview with Coverdale and more. Slide It In includes two U.S. rock chart hits — “Slow an’ Easy” and “Love Ain’t No Stranger” — and has sold more than 2 million copies in the States. Visit Whitesnake.com to check out a full track list, and more details about reissue formats.